Much has been written about the benefits of pool covers – how they keep leaves and debris out of your pool, how they prevent evaporation and heat loss, how they save on chemical and pool heating energy costs, how solar covers actually heat your pool. So we decided to canvass opinion, and talk to a few people* about their reasons for not getting a pool cover. Pool covers?! They’re for layabouts and socialists! Who in their right mind wants a warm swimming pool? There’s nothing more bracing than a headlong plunge into freezing cold water! And we had none of your nancy-boy Speedos back then, I can tell you. No, no! Good honest one-piece cossies. Hand-knitted! Made me the man I am today. That and chill blains. Did I ever tell you about the time my regiment got posted to Antarctica….? A pool cover, darling? Don’t be ridiculous. Of course I don’t have a pool cover. What a simply ghastly notion! Have you any idea how long it takes to roll them on and off every day? It must be fully two minutes a day! Darling, I simply don’t have that amount of time. Who does? Certainly not me, and certainly not on Tuesdays. That’s the day I have to look after the twins. Hmmm? Oh, the twins. Yes, they’re the product of Alisdair’s ghastly pre-me first marriage. What’s that? Yes, Alisdaire, he’s my husband…yes that’s right, Alisdair…D. a. i. r.
On Tuesdays I simply don’t have a minute to myself. Certainly not after I’ve picked up the brats, parked them for a while in the wine bar to play with their iPhones while I attempt to restore my composure, and then bring them back here to play at scooping leaves out of the pool all afternoon! Who has time for to take a pool cover on and off? Why would I want a pool cover? Why would anybody want one? Or need one?! Don’t you know anything about global warming? Haven’t you heard of climate change??!! Or what are you, a denier?! Do you think with all the harm we’re doing to the environment I’m going to spend my hard-earned dollars on pool covers when I should be sending it to Al Gore? Besides, global warming causes bush fires, for God’s sake! And I live next to the bush!! (Well, in the near-north Sydney suburbs. But that’s close enough!) Why would I want to cover my pool?! I’m going to need it open, uncovered, and ready for me to jump into at a moment’s notice. And the colder it is the better! Pool covers?! Are you mad?!! Bees, man, bees! Killer bees, for heaven’s sake! Did you never see that old Michael Caine film? The one where he was being chased by a swarm of mad killer bees on account of how he was…no, wait a minute, I don’t remember why they were chasing him…probably because they were bees. Anyhow, what was the name of the film? The Mob? No, that’s not right. Give me a minute. Oh, yeah, The Swarm. Anyhow, Michael Caine’s being chased by these killer bees. And that’s the problem with these pool cover things. Oh yeah, I grant you they sound all clever and sophisticated with their ability to retain heat, keep out leaves and dirt, prevent evaporation, and save money, but here’s the point: when you’re faced with a swarm of mad killer bees, you haven’t got time to mess around with fancy pool covers! You want to get straight into the water! Oh, no, dear. I wouldn’t want a pool cover. Why not? Camels. I’m worried about camels. I read this article once about how camels were introduced to Australia back in 1860. I know some people think they’re pests, but I love animals. And we have a duty to protect our natural fauna. Even if they were imported by a bunch of Afghans. After all, we’re all immigrants ourselves, aren’t we? I know camels don’t drink very often, but when they do they need to drink a LOT! How else are they going to keep their humps filled up? Well, I love animals. Did I say that already? So what would happen if a camel wandered into my backyard desperate for a drink, and couldn’t get to the pool because I had covered his (or her – let’s not be sexist) dromedarian lifeline with some stupid pool cover? I’d never be able to live with myself. And what would the neighbors say when they looked in and saw a dehydrated, dead camel lying in my backyard? CAMEL MURDERER!!! That’s what they’d say. Pool covers keep out leaves? But I enjoy cleaning leaves, dirt, and detritus out of the pool. It relaxes me. It’s me time. Alone with just the pool cleaner and the scoop net, I’m able to channel my inner being, focus on attaining a higher consciousness, and connect with the pool on a deeply spiritual level. The clogged up skimmer baskets are like sacred spaces. The piles of wet leaf mould fished out and dumped on the poolside are little altars of serenity. The algae growing up the sides of the pool represents the blooming abundance of life. And the drowned frog down at the deep end is a symbol of the Earth Spirit’s ever-flowing cycle of life, death, and rebirth. Though, frankly, I’m not sure this frog is going to get reborn. At least, not until after I’ve chucked it into the bushes. 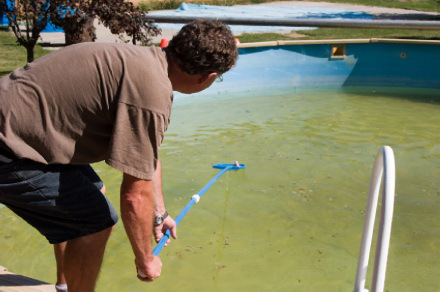 You say a pool cover will prevent evaporation? Evaporation is a LIE! A big, fat, EVIL lie put about by so-called evaporationists and their lying, crony “scientist” friends who distort the facts, make erroneous assumptions, lack any genuine evidence, and then brainwash our children that their “theory” of evaporation is actually a fact! If you want proof that evaporation isn’t true, then think about the FACT that there is NOT a single recorded instance of anyone ever seeing all the water in their pool suddenly shooting up into the sky. The reason no-one’s seen it, is because it’s NEVER happened! Yet evaporationists still expect us to believe that heat somehow makes our pool water magically levitate and turn into clouds! It’s laughable! Or, rather, it would be laughable if it weren’t so evil. The TRUTH is that clouds are created by Extra Terrestrial beings from the Tetrahedral-Shaped Galaxy, who now live at the centre of the earth, and control cloud movement via the karmic needs of specific geolocations! Evaporation? Don’t come the raw prawn with me! *Note: names have been changed to protect the identities of the people herein. That, and the fact they don’t actually exist.